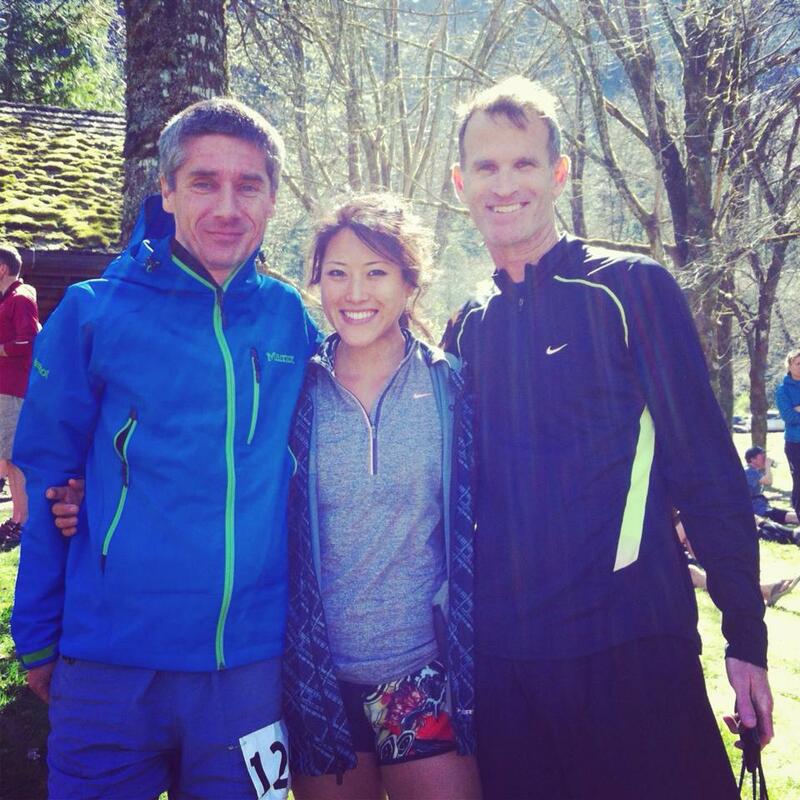 As with almost all of Rainshadow Running races, Gorge Waterfalls 50K was another bucket list race that I had wanted to do last year. 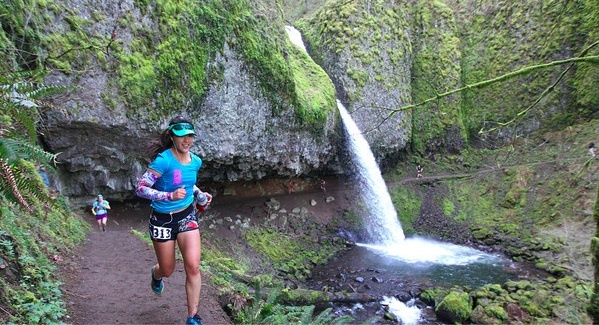 What’s not to love about mossy trails, lush forest, running along the Columbia River, singletrack trails and most of all, waterfalls! I was blown away again by this race organization how they are able to piece together some of the most amazing trails that are sometimes hard/far to get to and create a spectacular course for the runners. I love the low key feel in these races where the R.D. 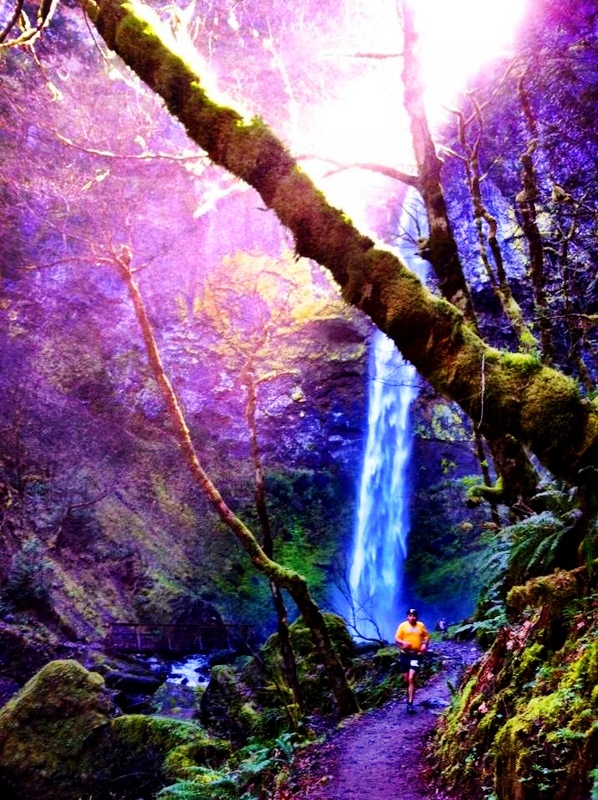 just wants to give the runners a chance to see incredible sights most people wouldn’t be able to see, in most cases, resulting in more elevation gain. Not to mention, probably the best post race party ever. I’ve only done Orcas and this race, but both times they had live music, tons of good food, raffles, homemade pizza located in a great atmosphere to just kick back and relax after the race. I am starting to fill up more of my calendar with their races, so very much looking forward to Winthrop Marathon in June. Anyways, back to the race. The race sells out FAST (75 minutes this year) and it will probably sell out faster next year so I was very happy to get a spot in the race along with a few friends. The course is an out and back with approximately 6,000 ft of gain, It has 1 major climb (2 miles long), but you hit it on the way back as well. That’s not to say this course is fast at all! I had been sick all week long before going into this race so I took it as a sign to just take it easy. Frankly, I wasn’t even sure I was going to make the trip with how congested I was feeling just a couple days before. I always knew going into this race it would be a fun run for me since Way Too Cool was only 2 weeks before. We started at Benson State Park, picked up our bibs, met up with Suann, Aron and finally go to meet Jojo! Love it when twitter friends become real life friends. The first mile was on a grassy double track along the road before we hit the parking lot to Multnomah Falls where we started a series of switchbacks on a paved road. I was feeling decent for not having run in a week so I ran most of it and hiked the really steep parts. When we finally topped out at the top at Mile 4, we were rewarded with a smooth padded dirt trail, heaven. I was looking forward to this smooth cruising for the remainder of the race, but I was so wrong! The smooth trail didn’t even last a mile before the rocks started jutting out of the trail making it hard to run and get even footing. We had a steep descent twisting and turning into the lush forest, slippery rocks and moss covered the trail, not to mention it ran by some waterfalls making it even more wet. We were running along the edge of some big drop offs making it a little scary to go fast. I usually love cruising downhills, but I had a hard time trying to get good traction on the rocks without wiping out or falling off the edge of the cliff. We even hit a patch on the trail where we had to scramble over rocks, no trail! 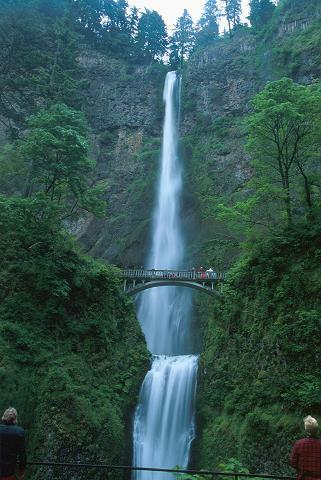 All the runners gasped when we ran right by one of the biggest waterfalls, Multnomah. It was one of those trail running moments where you can’t believe how incredible nature can be for all your senses and how lucky you are to be running in it. Picture taken from here.It was really hard to get a picture of the fall in it’s entirety. The first aid station came into view a little short of 7 miles and just as I was pulling out, Thomas caught up to me. It was nice to catch up and run a few miles with him before he pulled away. 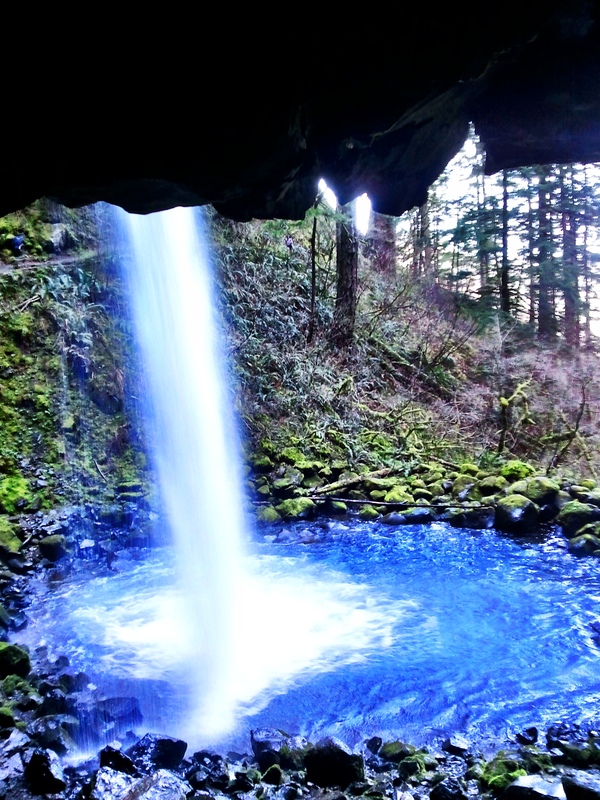 The next section was on a rolling trail, the most exciting part was being able to run underneath Ponytail falls! I had seen pictures from this portion of the trail before, but it was so much greater when you see it in person. You could hear the roaring of the water from a quarter mile away and as you approached it, the trail came in right underneath the fall. 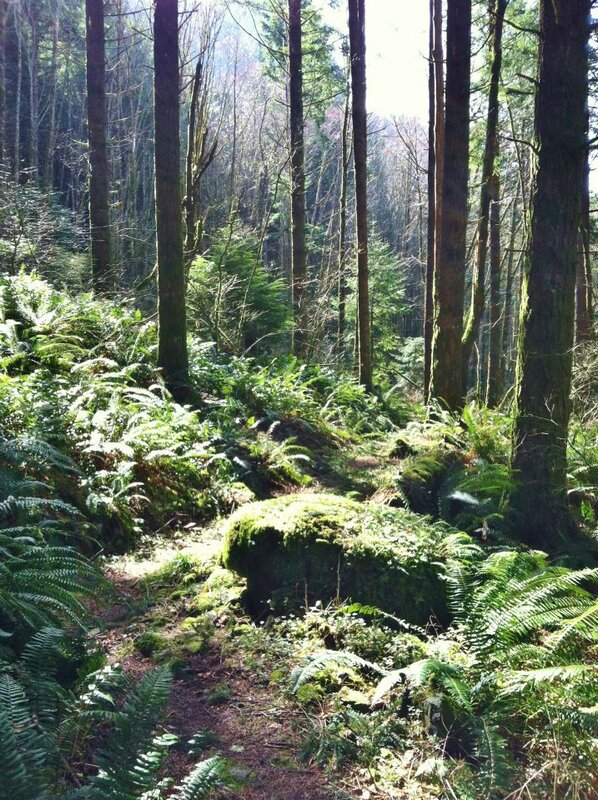 The trail was becoming more covered in moss and at times, it was almost impossible to see where the trail was going. I kept a steady pace and chugged along, sometimes getting my foot caught in between the rocks and falling (that’s how uneven the footing was). I was rarely running in a straight line, more like running left to right and constantly looking at the ground to avoid sharp rocks even though I wanted to look around at all the beautiful scenery. I think all the uneven running really took a toll on my energy later on in the race. We hit the road for about a mile and a half before getting to the second aid station where we would do a short out and back before coming back to the same aid. I could have done without all the road running, but it was nice to be able to run straight and not have to worry about tripping for once. It also gave me a chance to make up some time during these flat road miles. Upon leaving the second aid, we turned back on the trail and climbed to retrieve a poker chip to make sure you made it to the turnaround point. 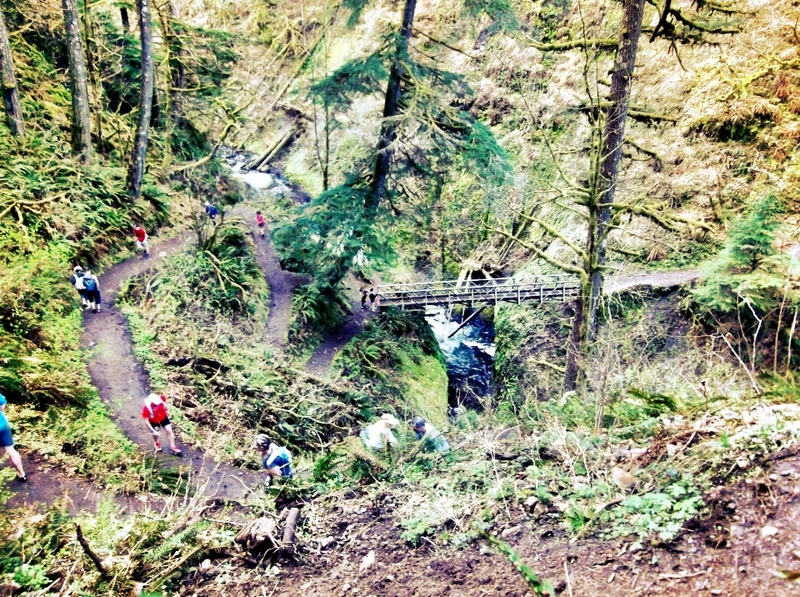 I saw Matt during the climb looking good and Thomas closer to the turnaround at Elowah Falls. This was the turnaround. I picked up my chip and headed back down the same trail. I was hoping to fly on the way back down the road since we had a nice tailwind, but my legs were feeling beat up so I did my best to shuffle fast and make it back on the trail. Not even a quarter mile back on the trail, I heard someone whistling to me that I had taken a wrong turn. I yelled out to the guy who was ahead of me as we backtracked our way onto the right trail. This goes to show how hard it is to see the trails here! I was feeling a little light headed and my chest congestion was getting worse, nothing nutrition related. I had to pull off the side of the trail a couple times just to take a couple deep breaths and let the people behind me pass. I knew we had that major climb towards the end so I took my time at the last aid station making sure to eat something and get my water bottle capped off. The trail was getting more and more crowded as we got near Mulnomah Falls and anywhere close to a trail head. 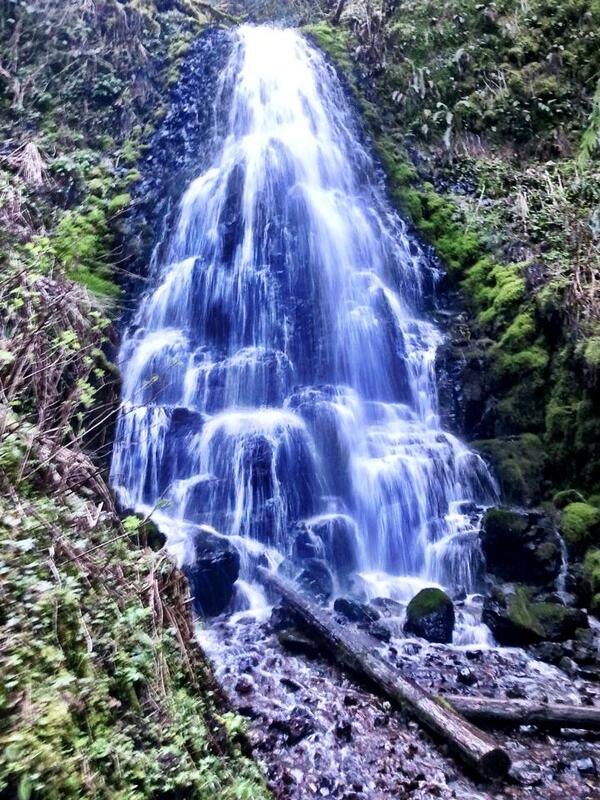 As soon as we started the climb up Mulnomah Falls, I suddenly started feeling really good. Channeling the #WUPower, I made sure every stride up was with purpose and started passing people. Just like at Orcas, my best miles were towards the end going up! It actually felt way better to hike fast than to run. 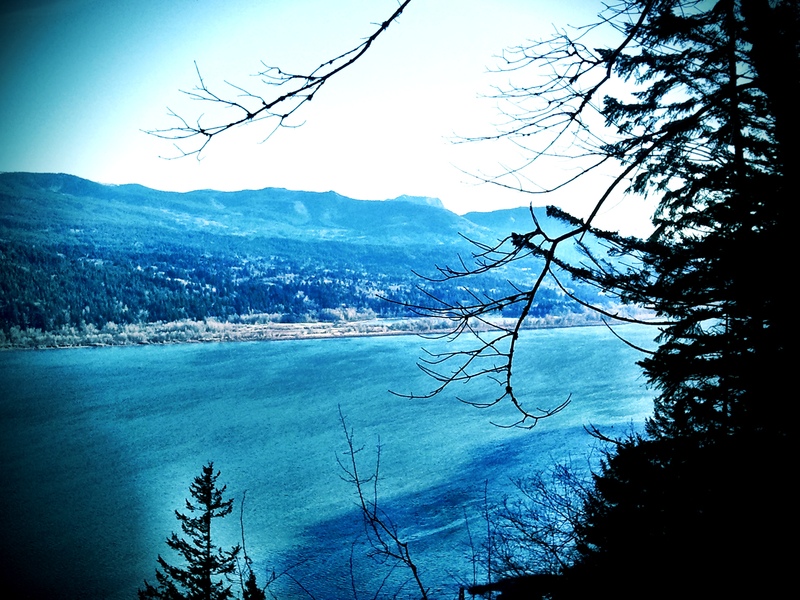 We climbed and climbed over steep rocky trails twisting and turning, occasionally popping out of the trees and getting a great view of the river and the mountains towering about it. Finally the trail started to level off for a little bit before we started our final descent down to the finish. The descent wasn’t as fast as I would’ve liked because it was so steep and you really had to put on the brakes when making the sharp turns. We ran through the same parking lot from earlier in the day, except this time it was packed with cars and hikers. From there it was a straight shot back to the finish line where I came in 5:23. Aside from the technical trail, the race was really fun and unlike any other. It’s definitely a course you want to go out and just enjoy with no finishing time in mind. Bring your camera because you can expect some really amazing shots along the way. Nice report and strong running with a cold! Nice photos! 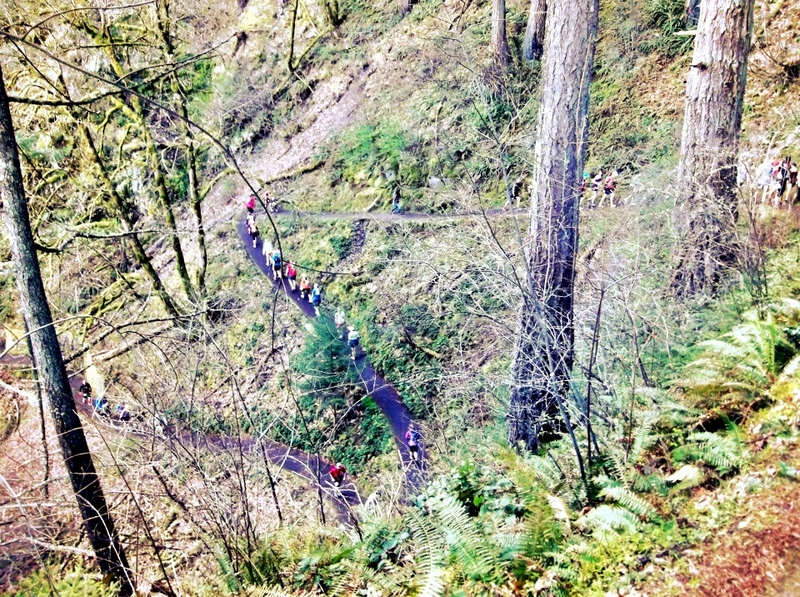 I especially like the ones where you can see all the runners on the trails!